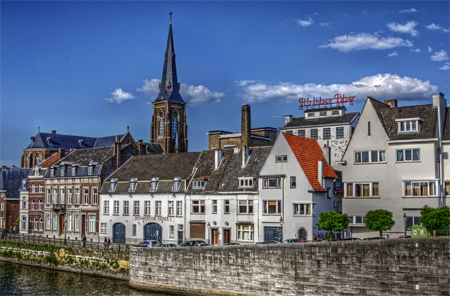 Maastricht in the Netherlands, where the Maastricht Treaty was signed. The Treaty on European Union (the Treaty of Maastricht) was signed in Maastricht on the 7th February 1992 and came into full effect on the 1st of November 1993 (this is why some people refer to the EU being created in 1992 and others in 1993). The Treaty brought the European Union into being and, despite other smaller attempts such as European Political Cooperation (a largely unsuccessful attempt at political coordination amongst member states before Maastricht), it was the first major step beyond the economics of the EEC and into the political realm. What changes were brought about by the Maastricht Treaty? How did the Parliament get more power after Maastricht? Focus also on the two major treaties that have followed Maastricht, Amsterdam and Nice. There are several key changes that the Maastricht Treaty brought about. You need to be aware of them – but don’t worry, they all should be familiar as they focus on topics we have covered earlier in the unit. Firstly, Maastricht created the EU’s three pillar structure and the EEC Treaty was amended and had its name changed to the EC Treaty (or more precisely the Treaty Establishing the European Community). More important than the structure per se is what was included in the second and third pillars. Before Maastricht there was very little political element to the EEC and the focus on justice, policing, security and defence in the Treaty on European Union were all broadly new at Maastricht. The Treaty on European Union changed the nature of the EU from a broadly economic organisation to a politico-economic one. Secondly, the Maastricht Treaty also introduced the ‘co-decision’ procedure, vastly increasing the role of the Parliament in certain areas (see module two for a recap on the decision making procedures). Thirdly, the Maastricht Treaty paved the way for monetary union for those states who chose to take part – a major integrative step. Fourthly, the Maastricht Treaty added a social dimension to the EU. Beforehand there had been little mention of social affairs at European level. However, the ‘social chapter’ was (and still is) quite contentious, particularly in the UK. 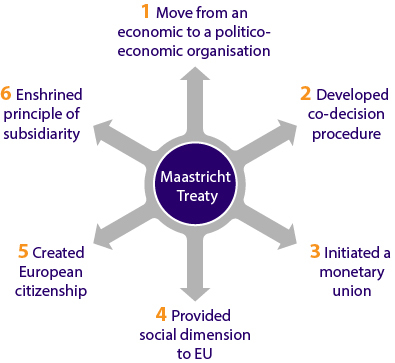 Fifth, the Maastricht Treaty created European Citizenship in addition to national citizenship. As you saw in the previous text, EU citizenship means an EU citizen can live and work and even run for elections anywhere in the EU. Finally, the Maastricht Treaty enshrined the principle of subsidiarity (as seen in module three) into EU policy making processes.